Floppies or CD-ROM. Use DOSBox and install the .07 Patch. The latest retail patch is .07 Patch. Patches do not integrate the previous patches and must be installed in order. The GOG.com version already has this patch. Darklands Quest Lister v.1.1 by Michael Petzold: Enables you to generate a list of your current quests from a save file. Very useful as this is the only non-manual way to track such quests. Darklands Map Tool by Savcho Savchev: Flash based; enables you to find towns from a clickable list. There is also a live online version. Darklands Saints Tool by Savcho Savchev: Flash based; enables you to view details of saints from a clickable list. Also allows you to view which saints offer particular benefits (for example, travel by water). There is also a live online version. Darklands Alchemy Tool by Savcho Savchev: Flash based; enables you to view details of potions from a clickable list, showing the required ingredients, quality, and risk involved. There is also a live online version. Character Editor v2.2 by Dan Collins ("jugglindan)": Enables you to edit characters' stats and appearances. Darklands Monetary Converter v1.1 by Jerry "Deth-B0y" Kelly: Enables you to convert "complex" monetary amounts (expressed in Florins, Groschen and Peffenigs) to "simple" monetary amounts (expressed in Peffenigs only) and vice versa. World Regeneration Tool by Dan Collins ("jugglindan)": Enables you to randomise and regenerate an existing world by rebuilding destroyed villages and other locations. Can also shuffle the world by altering the random seed used by the game to calculate item availability in various locations (saints, ingredients etc.). The seed also determines which villages and castles are good or evil. City Tracker Spreadsheet v1.0 by Paul Moloney: An Excel spreadsheet containing a row for each city in Darklands, showing hardcoded values (such as map coordinates, quality of blacksmith, bowyer and so on) with empty fields to fill with values particular to your instance of the game (for example, saints, formulae and physician quality). Saints selection spreadsheet by vakarr: a fully sorted and searchable saints selection spreadsheet. It has optional filters for every characteristic or possible use. A Y/N column lets you find all the ones you have and pick the one best suited to your purpose or the one with the lowest requirements or the one with the closest saint's day. 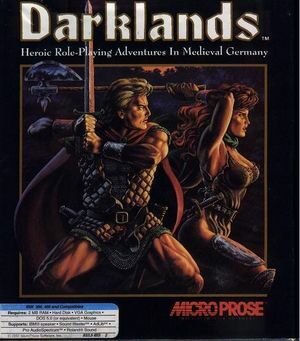 Darkland Explorations: A site containing details on Darklands file formats and interactive maps. Use this fix if the audio sounds unusual (e.g. random sounds rather than clashing weapons during combat). The game can be modified to support the MT-32 and SoundBlaster simultaneously. 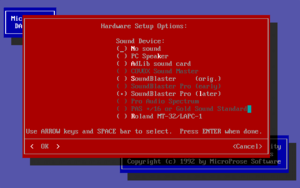 Ensure a non-Roland soundcard is selected (such as the SoundBlaster). Roland MT-32 music will not be correct unless you configure either a real MT-32 or an MT-32 emulator to run in DOSBox. ↑ Darklands README.TXT, "SIMULTANEOUS ROLAND & SOUND BLASTER SUPPORT"
This page was last edited on 14 December 2018, at 09:22.